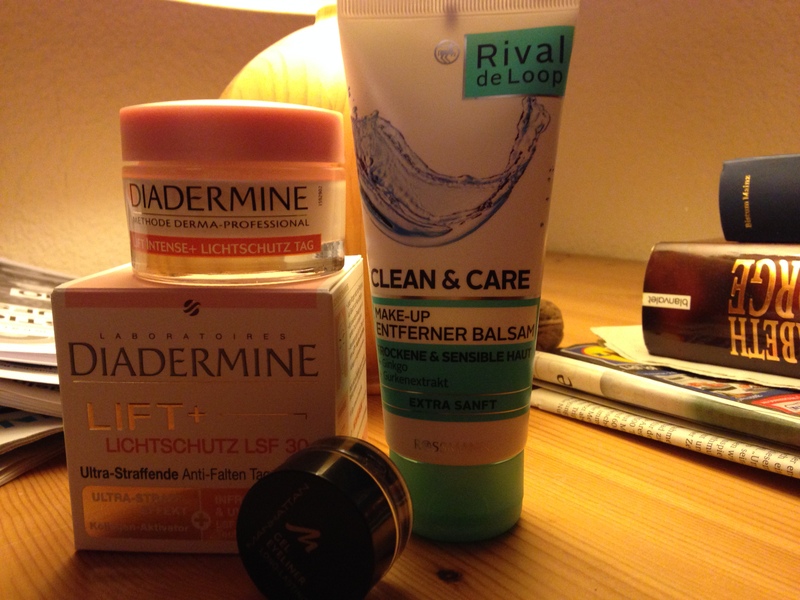 It was time for me to pick up some necessities from Rossmann so I thought I would post you a quick haul. The first product I picked up is the Manhattan gel eyeliner in black. My Maybelline black gel liner died and apperantly Manhattan is the only drugstore brand that still does a gel liner that doesn’t cost almost 10€ -.- Either way I heard good things about this one, I am currentlyout of black liquid or gel liners that I like, so I went for this one. We’ll see how it works. (I may use it tomorrow because I want to do a black red and gold liner for tomorrow’s Germany game). Next I bought the Rival de Loop Clean and Care Make Up Remover Balm. I am almost out of my Bebe young care Cleansing Lotion and wanted to try something else. This balm was a really hyped up product a couple of years ago here in Germany, and at 1.19€ it really doesn’t break the bank. It is clean of silicones, color, perfume and parabens and is supposed to be suitable for sensitive skin. The second ingredient on the list is glycerin so it should be really moisturizing as well. I can’t wait to try this. And last but not least (MINI haul. Told ya.) I repurchased a face cream. Hell must be freezing over somewhere. But yeah, it happened. I repurchased my Diadermine Lift +SPF. This stuff has done wonders for my skin. It is so much cleaner and healthier ever since I started using this about 6 months ago. I don’t know about the anti ageing and lifting effects as I mainly buy it for the SPF of 30 that it has. It claimes to protect from UVA, UVB and infrared rays. The box says it is meant for oily, dry and normal skin for people of 25+ years. I have combination oily skin that falls into the extremes (dry cheeks, super oily nose) and it works for me. It has a buttery slightly thick consistency but it melts into the skin and sinks in quickly and hydrates deeply without overloading the skin with oils etc. Also worth a note is that I don’t sweat under this moisturizer. The cream has an ECARF seal (European Center for Allergy Research Foundation) and therefore is supposed to be usable for people with highly allergic skin or generally sensitive skin, too. I had to learn the hard way that my skin is sensitive (again and again and again. [cystic acne on my forhead after using that Nivea Protect and Bronze face spf -.-]) but this one here doesn’t irritate or aggravate my skin at all. It helps it to be the best it has ever been. Obviously, I can’t speak for highly allergic skin and I think generally we should be careful with what we are putting on our skin, no skin reacts the same. Another big plus: At about 5€ it is a little gem in a pauper’s costume. I will never understand why people waste hundreds of Euros on high end skin care when there perfectly good stuff to be found on the high street. Like I said, mini haul, but I am genuinely excited for all the products I bought. Did you buy anything fun and/or exciting recently? Any skincare tips for combination oily skin? Just pop them in the comments below!